What's Make Poverty Personal like? I hear you ask...well, it's creating quite a stir amongst those who have been reviewing it and we have been overwhelmed by the number of endorsements and reviews rolling in from a number of Ash's heroes, mentors and friends from right around the world and across almost every denominational border. "Personal, passionate, authentic, challenging, engaging, relevant. These are some words that readily spring to mind on reading Ashley Barker's new book. This is no programmatic or utopian vision for ending poverty and injustice in our deeply wounded world. Instead, this is powerful testimony, rooted in the biblical story, in costly discipleship, and in risk-taking involvement to follow Jesus the servant of God to the poor. The book calls us to rethink our values, to retool our vision, and reprioritise our lives in order to be God's transformational agents in a world where the cry of the poor has become an indictment of our lack of humanity to others. This book is not structured for the quick read but for a grappling engagement regarding the call to all to bring God's shalom to all the places of injustice." 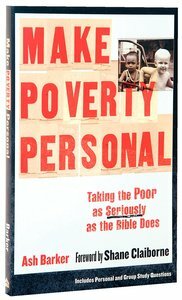 " Make Poverty Personalis an impassioned challenge to Christians to take seriously the Bible's most ignored message. Ashley Barker has written it from the heart of a Bangkok slum, so the sights, smells and sighs of poverty as two-thirds of our world experience it are woven into this compelling text. I commend it to you with the proviso. . . Beware: It could change your life!" Poverty is one of the great challenges of the 21st century. But poverty is not new. And neither is God's deep concern for the poor--it is a theme deeply woven throughout the Bible. Yet sadly, churches and individual Christians have too often been blind to this emphasis, or they have been paralyzed into inaction by feelings of helplessness. In this urgent, provocative book, Ash Barker offers both challenge and hope. Pulling out and reflecting on significant passages from both testaments, he reveals what the Bible says about both the nature of poverty and about how God calls his people to respond. These studies, ideal for either individual or small group use, are interlaced with personal reflections--first-hand accounts from fifteen years of ministry among the poor. Ash and Anji Barker, founders of UNOH, and their children Amy & Aiden live among the poor in the Bangkok slum of Klong Toey. Like all UNOHs workers, the Barkers have a passion to love God and neighbour so much that the urban neighbourhoods they live in become like villages centred on Christ. Ashley is the International Director of UNOH with UNOH chapters in Bangkok, Melbourne and Sydney. He has authored Making Poverty Personal, Collective Witness: A theology and praxis for a missionary order and Finding Life: Reflections from a Bangkok Slum.